The office of the Controller of Examinations is concerned with the examination of the whole university as well as its affiliated colleges (Medical, Engineering, Textile and Agriculture). The office deals with all matters associated with examinations, result publications, issuing certificates and transcripts, verification of documents, etc. In addition, it has responsibility to take necessary steps for evaluation of MPhil/PhD degree. (a) General Section (b) Question Section (c) Script Section (d) Results Section (e) Store Section (f) Mark Sheet Section (g) Provisional Certificate Section (h) Original Certificate Section (i) Record Section and (j) Examination Bills Section. The university authority thinks that it is the time to establish the automation system for this office. 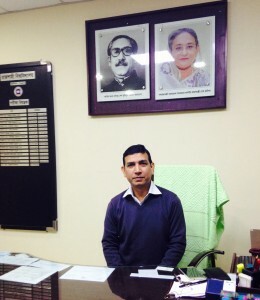 In this connection, the office of the Controller of Examinations has started its automation process. We have already launched online examination’s form fill-up system and it has been working since February 2018. Online result processing system has also been installed for the Faculty of Engineering. Very soon we will install result processing system for other faculties. We firmly believe that the office of the Controller of Examinations will be fully automated within a short period of time.